Texas Boxer Rescue View other Boxers for adoption. Do you like the song 'Girls Just Wanna Have Fun?' Well then, you have found your 'fun girl' �'�|meet our little Rebel! This Rottweiler-Boxer mix is not only strikingly beautiful, she is full of life and love. Rescued from a kill shelter on her last day to live, Rebel's resume did not include any social skills at all; nor did she know how to act around other dogs. She arrived at her foster home as a wild child, pretty much untamed, but sweet as she could be; thus, she earned her name, Rebel, which means 'wild spirit but a loving heart.' Rebel has now been professionally trained to be calm and play nice with other dogs. In the past, she wanted to play; however, she has now learned there's a better way to make doggy friends than approaching them like a linebacker. Rebel's trainer uses only positive reinforcement through communication and praise; there is no punishment or use of correction collars. The lucky adopter selected for Rebel will be someone who will continue these very effective training methods. She's silly; she's sassy; and she will make you laugh. This little girl adores people, and she will win your heart in a matter of minutes. She loves children, especially if they have boundless energy to play with her. She thinks toys are one of the world's best creations, and loves to chase a ball, running a few extra laps before she brings it back �'�|.Isn't that how you're supposed to play ball?? When Rebel is not playing, this love bug wants to cuddle, while staring into your eyes for reassurance that you are happy with her. 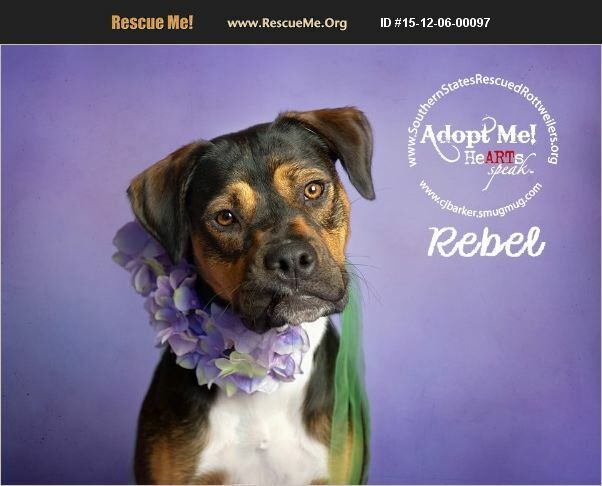 Rebel is approximately 1 �%BD years old and weighs 45 lbs. ; she is housebroken and crate trained. She is also highly intelligent-- there is no limit to her ability to learn new things. Rebel wants her very own family who will love and protect her. If you're looking for unconditional love, along with a best buddy to hang out with, Rebel is your perfect match.